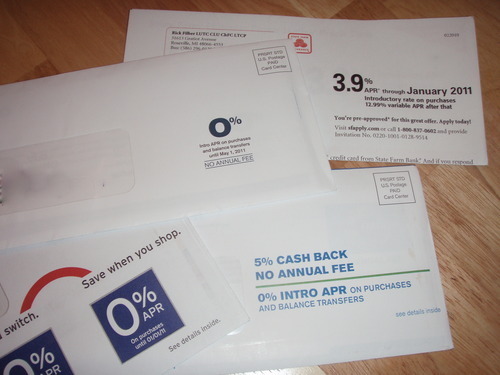 How much of your mail is junk that you don’t give a second look to before tossing in the trash or recycle bin? I would venture to guess that at least half of mine is either bright white envelopes with mysterious return addresses trying to convince me to be impressed that I was approved for another credit card or glossy sales fliers for places I don’t shop. A few days ago, I finally decided to tear open one of the envelopes suggesting I be wowed that I was pre-approved for a credit card and see if there was fine print telling me how to stop the madness. (Honestly, it doesn’t matter how low the interest rate is — I need less credit card debt, not more.) I was shocked to find that the opt-out phone number was easily visible on the bottom of the first page. Upon calling it, I found out that with a few easy steps (or not so easy, depending on how well you communicate with the computer on the other end of the line) I could be taken off the mailing list for five years, meaning I would no longer receive “firm offers of insurance or credit” based on my credit score. This is the Federal Trade Commission‘s Credit Bureau opt-out phone number, which covers three major credit bureaus, Equifax Inc., Experian and TransUnion. I was excited by the idea of not only saving myself the annoyance of the pre-approved credit offers that make their way to my mailbox almost daily, but also saving the trees they’d be printed on. According to that automated voice, it can take several weeks to stop receiving the offers because many places work well in advance. I’m optimistic that I’ll see a significant reduction in those envelopes that scream in bold print how I can transfer balances for zero percent interest for six months. I’ll keep you posted on how quick I notice a difference. Here’s hoping! If you want to cut back on the paper waste too, call 888-5-OPTOUT (888-567-8688).